I've said it before, but if I had to choose a last meal, it would undoubtedly be the freshest Caprese salad. This is a particularly torturous favorite meal, because it is really only good two months per year. At it's heart of food ecstasy hearts, it's all about the tomato. Sweet and dribbling juicy. I'm ready for dinner. But wait, it's March there is not a decent tomato for one thousand miles. Whoa is me... my life is hard. This tomato soup actually brings out the best of winter tomatoes and tastes fresh and nearly summer-y. Winter tomatoes just don't have the concentrated flavor or sweetness of summer beauties, but roasting them intensifies their impish flavor just enough to fool you in soup. 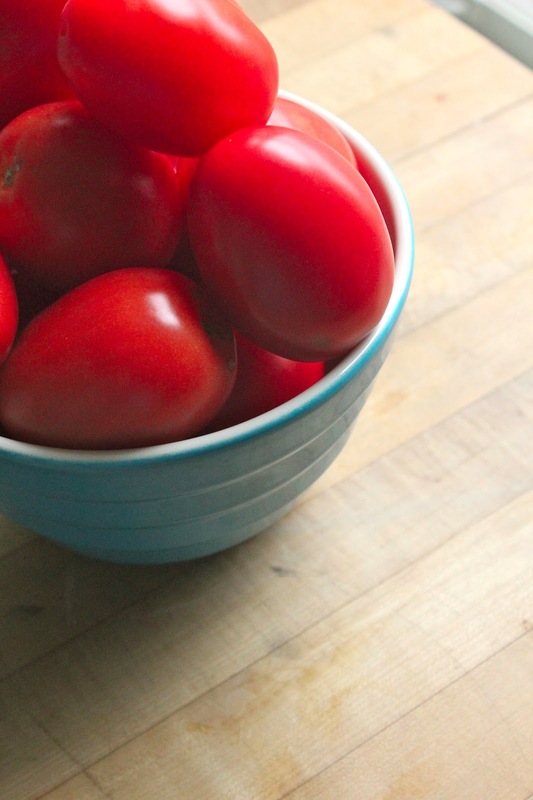 Start by finding the reddest tomatoes you can find in your produce section. While I opt for beefsteak or heirloom in the high holy summer, Romas often have decent texture year round. Here's where things deviate from the typical canned soup... I've added roasted fennel. Just a bit adds incredible depth of flavor and freshness. Tossed with onions and a bit of garlic for roasting on the side of the pan. After a bit of time in the oven, look how gorgeous. You can almost see the intense notes of those tomatoes. Simmer ingredients together for a bit with red wine, chicken stock, a bit more onion and loads of basil. That roasted garlic will squeeze right out, soft and supple. 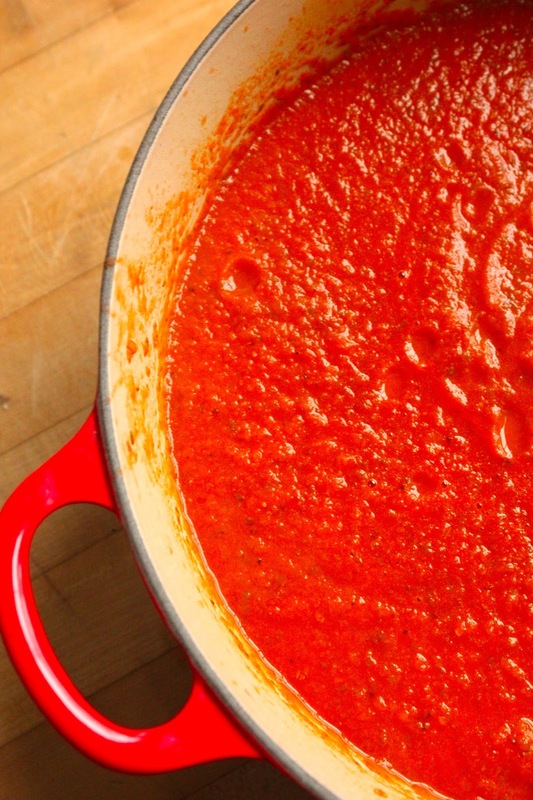 A quick whiz with an immersion blender or in the food processor and you have a fresh bite of tomato. Sweet and juicy enough to tide you over to July. Heat oven to 450 degrees. 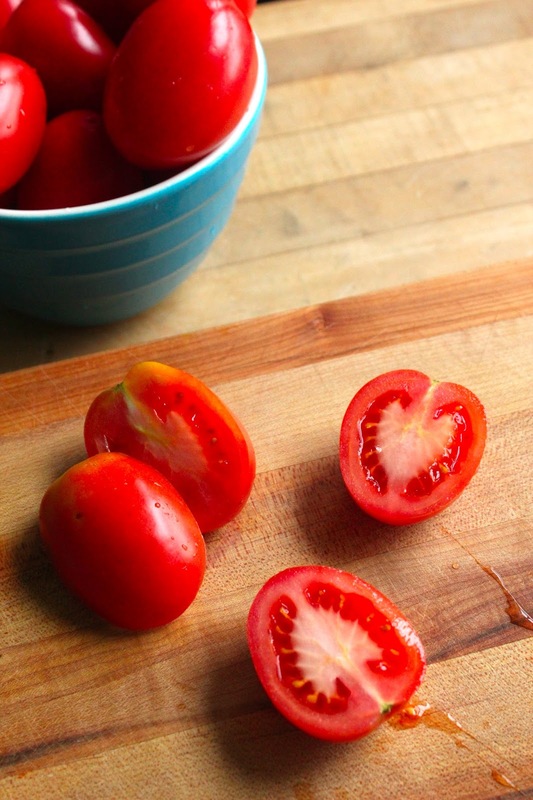 On a large, lined cookie sheet toss tomatoes in one tablespoon olive oil, salt and pepper. 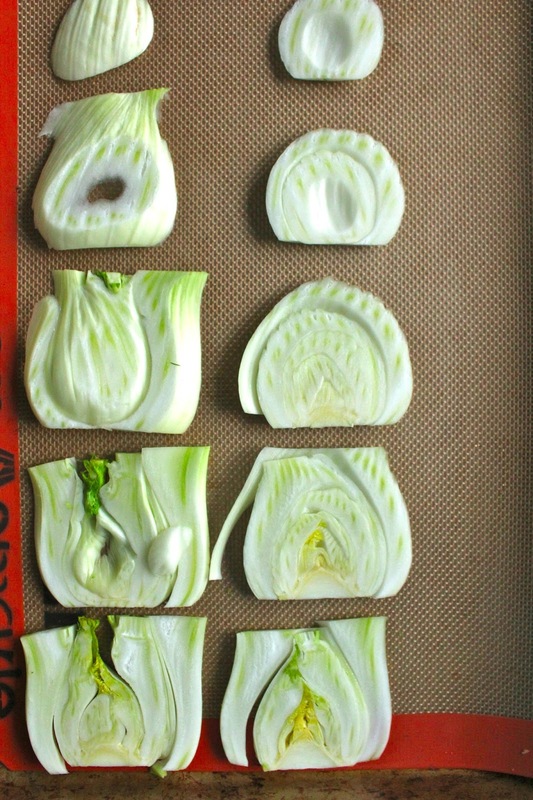 On a separate cookie sheet, toss fennel and sliced onion with one tablespoon olive oil. Using a sharp knife, slice off the top of the garlic and wrap in aluminum foil. Roast vegetables and garlic in oven for 35-45 minutes. In a large dutch oven, warm remaining olive oil over medium-high heat and saute diced onion. Add red wine and allow alcohol to cook off for 1-2 minutes before adding canned tomatoes, chicken stock and basil. 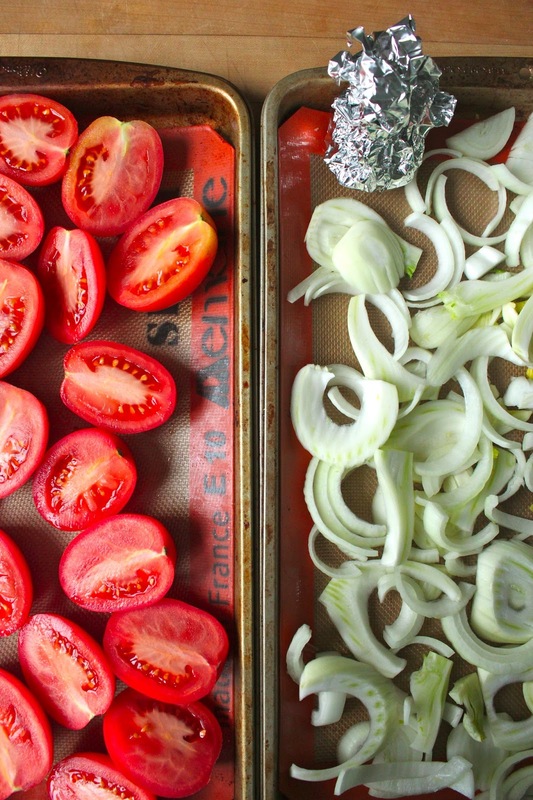 Add roasted tomatoes, fennel and onion to soup and simmer for 40 minutes. When soup has finished simmering, blend until smooth. Serve warm garnished with basil.